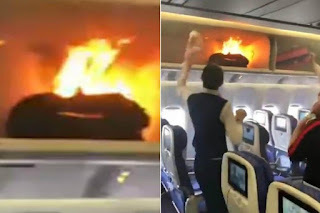 A portable charger battery pack burst into flames in the overhead luggage compartment of a China Southern Airlines aircraft on Sunday 25th February afternoon while passengers were in the process of boarding. The fire caused a three-hour flight delay to flight CZ3539, which had been scheduled to depart Guangzhou Baiyun International Airport heading for Shanghai Hongqiao International Airport at around noon. China Southern Airlines said o that a passenger's cabin bag had emitted smoke and fire during the boarding process. A crew member tackled the burning bag with bottles of water which seemed to douse the flames. Airport firefighters ensured the bag fire was properly out. There were no reports of injuries after the incident which only caused minor damage to the aircraft's cabin and passengers were put on a replacement flight a little later in the day. According to local media, the fire was caused by a portable charger, which was not in use at the time, although an investigation is currently continuing. The owner of the cabin bag is currently assisting in investigations.